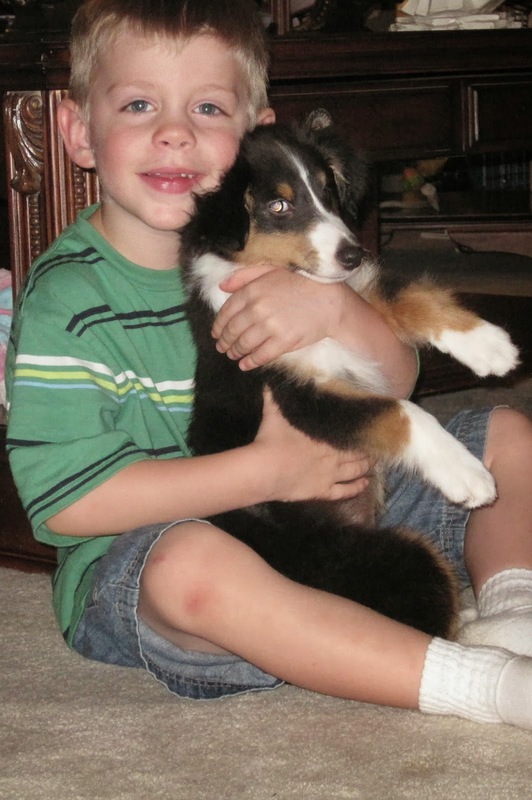 I signed up for seven runs at the Run as One NADAC agility trial on Sunday, January 6, 2013. My dogs and I both love agility. So much! But, I was a little concerned about whether or not I was going to have it in me to make the drive to Terrell, TX (about an hour away), set up crates for Cotton and Barney, and then manage to run them throughout the day. When I signed up for the trial, I carefully considered which runs to include on my entry. If Barney had a title on the line, he got the run. If it was something Cotton loves to do (like tunnelers), she got a run. I made sure that both dogs never ran in the same class at the same level. It was really hard to narrow my entry down to only seven runs. Only seven runs. Considering that I often ran 12 or more at a NADAC trial, “only seven” is accurate. But, for someone undergoing chemo and suffering from lung cancer and emphysema, “only seven” sounds like a lot! My husband Robert and I hoped to make it out to Terrell to set up the crates, etc. on Saturday afternoon. But, I was extraordinarily tired and needed to rest first. By the time I was rested, it was too late to go out there. I was afraid we would drive for an hour and find no one at the arena. We would have wasted a trip. Robert is not the agility aficionado that I am, but he planned to go with me to the trial on Sunday to ensure that I had someone there with me in the event that I had bitten off far more than I could chew! Imagine his delight when my friend Dori texted me and offered to go along with me to the trial! It let him off the hook and I was glad to have someone going with me that loves agility as much as I do! I can’t tell you how much I appreciated her offer. She had to get up at about 4 AM to be at my house in time for us to drive to Terrell and arrive by 7. That’s a good friend! Run As One trials are delightful. They are relatively small and very friendly. I know nearly everyone who comes out to compete and consider many of the competitors good friends. I think almost everyone knew of my condition and were extraordinarily supportive. Since Dori was sweet enough to give up her Sunday to go with me to the trial, I decided that she should be the person that primarily ran my little Barney. He is a fun dog to run in agility – he loves it and, while he is not the fastest dog out there, he is a very accurate competitor. Cotton has a blast on the agility field, but she is as likely to make up her own course as not. The likelihood of earning a qualifying score is pretty slim when running Cotton! I love to run her but would certainly hesitate to ask anyone else to have the same pleasure! Dori ran Barney for four of his five runs. I wasn’t sure if he would run with her or not, but run he did! They earned three qualifying scores. One of those “Q’s” earned his Open Regular title – he has now earned the right to run in Elite Standard. When I started NADAC agility, I never really imagined that any dog of mine would make it to elite! I ran Cotton in Tunnelers and Chances. Her Tunnelers run was actually quite nice after she settled down a bit. Her Chances run was not so nice, but she had a really good time! We had so much fun! I wasn’t sure if I would be able to continue training and trialing after I was diagnosed with lung cancer. I am absolutely gratified that we were able to go and even to compete some. We do miss a lot of classes because I come home from work too worn out to make it to class at night. And, because of the chemo schedule and being too sick to get off of the couch, much less go run in a trial, there is a relatively small window available to me to trial. But, it can happen and we can be competitive. The Run as One trial proved that to me. It also proved to me that I have some very delightful friends! It goes without saying that Dori earned a special place in my heart for her willingness to come with us and help me all day long. My lifelong friend Patti drove all the way from Irving to Terrell to spend several hours with me out in the cold arena! She doesn’t even run a dog! Bridget came to the NADAC trial only after seeing how supportive they were of me. Other friends were at the trial primarily because I had signed up for that day. How special is that??? SO special!!!!! Posted on January 14, 2013 April 23, 2018 Categories agility, cancer, dogs, lung cancerTags emphysema, NADAC, Run As OneLeave a comment on Agility Fun! So … I am one of those people who do not go to the doctor. Ever. It just isn’t something I’m willing to do. For any reason. But, one fateful day in October 2012, I decided it was time to go for a physical. Why? Because I kept getting bigger and bigger and I was just certain that I had thyroid issues. 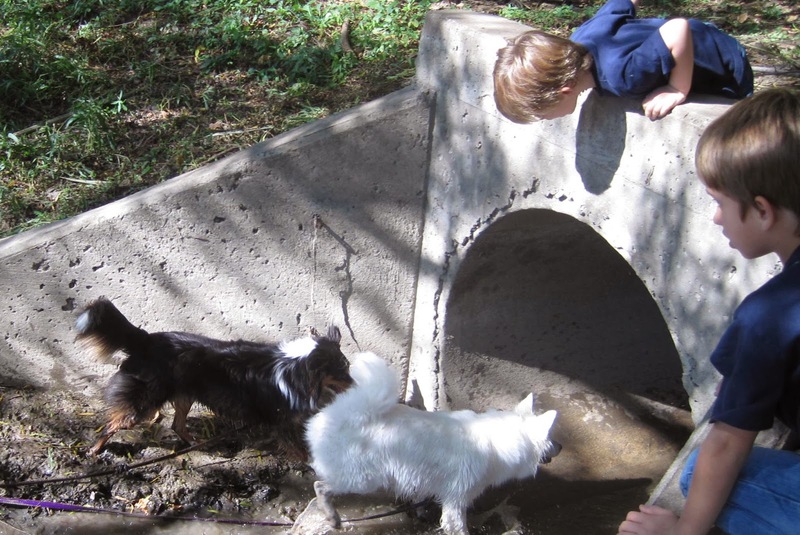 I am very active – I have two wonderful dogs (you’ll hear lots more about them!) that I do agility with. I was in class three nights a week and most weekends would find me at agility trials where I not only ran my dogs, but also worked in the rings throughout the day. Nevertheless, my stomach grew and grew and grew and I finally was fed up with it. So, I found a doctor that took my insurance and waited for a new patient appointment to become available. I chose my doctor based on her name — Dr. Donna Casey — because she (1) had a good ranking with Blue Cross-Blue Shield, (2) took my ChampVA insurance, and (3) shared the same name as a friend with whom I worked. Best decision I have made in a long, long time was making an appointment with Dr. Casey. When I arrived at her office at the end of October, she asked some questions and then did an exam. I nearly forgot to mention a knot I had found on my collarbone … but she had discovered it already anyway. Since I was a former smoker, she had already asked me if I wanted to have lung x-rays. Since I had quit 4-5 years previously, I thought it might be a good idea to see how much damage I had done over the years. After she discovered several knots around my collarbone, she suggested a CT scan might be in order. Her office made an appointment for me to have the scans that same day. The scans were not clear like I expected them to be. When Dr. Casey called, she said they showed that I have emphysema, which for some reason really didn’t bother me much, and that there was some other activity that we needed to look at further. Believe it or not, I was far more concerned with what my thyroid test said – I was still far more concerned about the weight gain than errant cell activity. That changed some when the doctor started talking about having biopsies or a PET scan. I had no earthly idea what a PET scan was, but a little research revealed that a positron emission tomography is a test that is primarily used to diagnose (1) heart disease, (2) dementia, (3) epilepsy, or (4) cancer. It didn’t take a rocket scientist to deduce that Dr. Casey was worried that I had some form of cancer. If you can hope for a kind of cancer, I hoped it would be some sort of lymphoma. What I absolutely didn’t want it to be was lung cancer – especially since my dad died from lung cancer at only 49 years of age back in the mid-70’s. But, we don’t always get what we want. After the PET scan was done and interpreted, Dr. Casey called with the the bad news. I had lung cancer. She had already made me an appointment with an oncologist for the next day. It was Dr. Lalan Wilfong at Texas Oncology who got to tell me and my husband Robert that I had stage 4 lung cancer. There was a spot in the left lung, a great deal of involvement of lymph nodes in the lungs, and tumors in the lymph nodes at my collarbone on the right side. It is inoperable. And, there is too much involvement for radiation. Our only option: chemotherapy. Things moved quickly once the cancer was diagnosed. It is a fast-moving cancer so the quicker chemo could begin, the quicker we could try to halt its progress. The average lifespan for people with this lung cancer is only 1-1/2 years. I’m only 59 years old and I have a lot of living I still plan to do so I surely do hope to beat those terrible odds. I pranced into chemo for the first time – ready to go! Let’s get “lit up” and start fighting back against this insidious, but oh-so-silent, disease. It took most of the day by the time we visited with the doctor, got insurance straight, and got the actual chemo. (It may mean something to some people to know which drugs I am getting: carboplatin, pemetrexed, and avastin. The chemo nurse told me they were the latest, the best, and very expensive. I have no idea!) We did a short video of me getting ready to start the chemo. I was going to do a documentary. Maybe I still can via this blog. My 82-year-old mom and my husband Robert accompanied me to my treatment. Mom sat through the whole thing. Robert doesn’t sit well so he comes and goes throughout the experience. The infusion room was an interesting place – there were all ages of people sitting in the chairs getting chemo. Some people had hair; some didn’t. Some used ports and others, like me, got their treatments intravenously. Surprisingly, the vast majority of people receiving chemo were women. What’s up with that? It was fairly unremarkable to receive chemo. I didn’t feel good or bad during the infusion. I felt just fine when it was over. There is really no need for me to have accompaniment – other than it makes those who sit with you feel better that you’re not alone. I’m such a loner that it honestly wouldn’t bother me to sit there and play on my tablet or phone or just rest, but that’s not how it is going to be. Not really, but you would think so based on my appetite since I have started chemo. I don’t want soup or bland foods. Oh no!! I want Mexican food or chicken fried steak or roast beef and mashed potatoes. And, whatever it is that my mind gleans on that day, I nearly obsess over it! My poor husband has been such a trouper as we go from one thing to the next, satisfying my latest cravings. Yeah, I’m not losing much weight as I undergo chemo. That belly is still at least as large as it was before. That makes me sad. Well, the day of chemo and the first day thereafter, I felt just fine. I popped up out of bed on the day after, walked my dogs like I always do and got ready and went to work. I was full of pep and energy until around noon. At that time, fatigue set in. I left the office a little early and came home. I had really hoped to go to agility practice that night, but I was way too tired for that. I missed the next couple of days at work (Thursday and Friday). I was in bed the entire time. No eating. No drinking. Just sleeping. With my Sheltie, my Barney boy, cuddled right up beside me the entire time. I loved having him lay right up against my body. It was like I could nearly feel the heat of his body pulling cancer out of me. Of course, there’s me… Worrying that if his body is pulling the cancer out of me, I sure hope it is not pulling it INTO him! That would never do. Try as I might, I just couldn’t get to agility practice that first week after chemo. I had the desire, but I sure did not have the get-up-and-go needed. But, when I got up on Saturday morning, I was determined to go to class. I did not feel good enough to go, but I got dressed and off we went. Robert went too, in case I couldn’t drive home. It took everything I had to run those courses that day, but Barney and Cotton each got a couple of runs around the agility field. It was as exhilarating as it was exhausting. If you haven’t had chemo, there is no way to understand the fatigue that sets in. I could literally barely drag myself and Cotton and Barney to the car after I threw in the towel on practice. Robert drove us home. We nearly made it home before I got sick, but he had to pull over and let me throw up. We got home and I had diarrhea. But, after that, I felt good again. The next couple of weeks went fine. Unless I overdid it at work. Which I was sometimes prone to do. One Friday I so overworked my tired body that I was nearly dead in my tracks. Robert and I went to eat in Rockwall and I could barely make myself eat. Still, I drove home. And fell asleep while waiting on a turn arrow. Thank goodness Robert was in the car with me and could wake me up! I was really only dozing, but it wouldn’t have taken much for me to go into a full-fledged sleep right there in the turn lane! That’s tired! Since it was December, a lot of our agility classes were canceled due to the holidays. We managed to make a couple of Saturday DAWG classes and one Thursday class at Dallas Dog Sports. 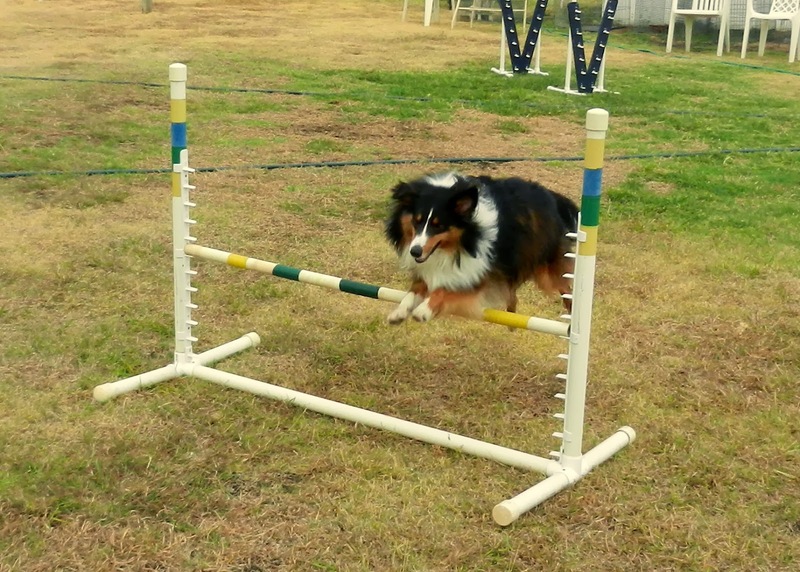 The dogs and I had a blast at all of the classes – I do love agility! And so do they! It is great exercise and such a fun way to play with my beloved dogs. And, the people – you just won’t meet finer. My attitude has remained positive. I am not really afraid. I usually don’t feel like it isn’t fair that I have cancer. (Who smoked? Me! Not that I think I deserve to be sick, but I guess my attitude is more like, “Why not me?”) Sometimes when everyone starts talking about their trial results and I have been too ill or tired to go, I am sad that I didn’t get to go play with my dogs and friends, too. The competitive side of me hates to see us fall behind in earning those qualifying scores and titles. But really? If that’s all life is, I think I may need to be re-examining my values a bit. Being diagnosed with cancer brings some interesting insights into who your friends are. People who you thought were your good friends and that you would have done (and did) a lot for are not necessarily those that are there for you. And, then there are those that you liked but didn’t consider close friends who are more than there for you – who are willing to do anything and everything for you. Sort of makes you pause and say a little prayer of gratitude – for the insight and for the wonderful, wonderful friends who are there for you not just when you can do for them, but when you can’t. Those who remember you even if you are not physically where they are. Those who understand that it is hard NOT to be able to do the same things as they enjoy when you, too, enjoy it so much. Yep, I’m getting a bit maudlin so I believe we will move on from here!!! Wallowing in self-pity is ugly, no matter who is doing it. I have no patience for it – from myself or anyone else. I have actually worked at maintaining a bright and cheerful attitude and I don’t dwell on being sick or require (or ask) that anyone else feels sorry for me. What I want to is to still be able to laugh and have a great time and for no one to feel uncomfortable around me because I have cancer and I may be dying. Truthfully, we’re all dying with every breath we take. Some of us may have fewer breaths to take. If that’s me – well, I want the breaths I have to count!!!! I want to have fun and enjoy what life has to offer. Otherwise, why bother to go on living? On the other hand, I do expect that people show a little respect for my weakened condition. The chemo makes me very susceptible to disease. If you are sick, please do not knowingly share my breathing space. You feel bad when you are fighting an infection or the flu; I could end up in the hospital or worse if I catch it. If you know you are going to be somewhere that I was planning to go, just let me know you are not feeling well, but are going to be wherever. I can and will stay home so that you can keep your plans. Off of that soapbox and back to my surprising friends. Some of my friends have just been remarkable and deserve special recognition. It is scary to start recognizing people because inevitably, I will leave someone out and the very last thing I would ever want to do is hurt anyone’s feelings. Because I appreciate the friends who have offered to do things and been rebuffed by me and the friends who post little “I’m thinking about you” or “You are in my prayers” comments on Facebook. Those reminders that people care mean all of the world to me. So, so special. Sally from work just can’t do enough. She brings us food, food, food and so much love and concern. Sally and another friend from work, Cindy, are my chemo angels. They bought me a wonderful bag, pjs that I wear every night, socks, lotions, lip creams, the list goes on and on and on. My friend Ann too has been there for me. Getting up early to walk with me so I don’t have to walk by myself, bringing me good food to eat, willing to do anything and everything. 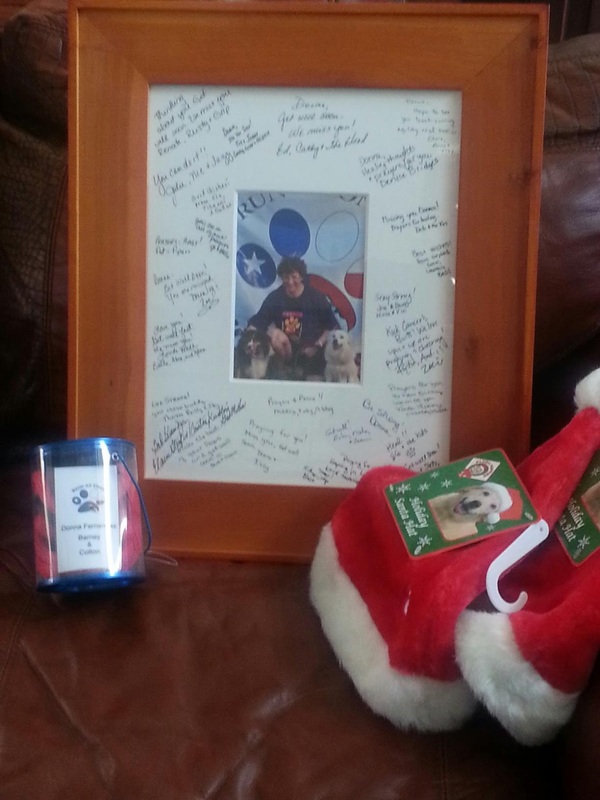 Charlene brought me a warm, cozy jacket, socks, a blanket – so many things – even goodies for the dogs – wow! Just so much thoughtfulness. I often wonder if I would be so generous and thoughtful if it was them instead of me. It causes me to really think and reflect on that because I now know personally just how much small gestures mean – even a relatively simple “how are you doing” post on Facebook. Last but far from least – I just have to recognize Ed and Run as One Agility. I was signed up to do an agility trial but had to cancel because I was just not in good enough shape to go after chemo. Ed took a picture of me and my dogs and had everyone at the trial sign it. Framed it and brought it all the way over to me. It hangs in an honored spot in my house. I hadn’t cried much over my diagnosis (then or since), but I certainly did cry when I opened the package. Wow. I’ll have to get a picture of it posted here. And, then there are my agility friends who will be with me on Sunday, Jan 6, at the Run as One trial. Some of them signed up for the first time ever for a NADAC trial so that they could be there to support Run as One since they supported me and to be there with me. What can you say??? What can I say? It is overwhelming and so very special. The three weeks between chemo treatments dragged in some ways but sped by in others. In some ways, you want to keep those chemicals flowing in your body. The cancer is pretty rampant in my body and if the chemo can stop it in its tracks, then lets keep the chemicals there!!! On the other hand, it is just about the time that you start feeling pretty good for a good portion of the day that the time to “get lit up” returns. I’d been told that every successive treatment is worse – the impact is cumulative. That makes sense. Each treatment takes you down more and more. Knowing how I felt during the worst times after Chemo #1 surely does not make me look forward to experiencing that again, but on a grander scale. I was upbeat, but not quite so bouncy when I returned to Texas Oncology on December 27 for my second treatment. I had blood tests and a brief visit with Dr. Wilfong before going back to the infusion room. My blood tests came back great. It is so ironic that I am so extremely healthy except that I have this terrible disease that wants to kill me off sooner rather than later. My blood pressure is fine. My blood sugars are great. The only pills I take are folic acid (for some reason it is needed due to the chemo) and Vitamin D3 pills. I give myself a monthly B-12 shot. My first-ever mammogram came back completely clear; the first pap test in over 10 years was clear … I am very nearly the picture of health. I had been monitoring the tumors on my neck and felt like they were smaller. Yeah, so small that I could no longer feel them! But, sometimes hope can play tricks on you so I wasn’t counting on the accuracy of my self-exams. Great news! Dr. Wilfong couldn’t feel those tumors either! In fact, the first chemo treatment shrank them to the point that they cannot be felt. Maybe they are gone altogether. I sure do hope so! Even more, I hope that those masses of tumors in the lymph nodes in my lungs have responded in kind. Now THAT would be the absolute best news I have had in a long, long time. So, knowing that the chemotherapy is working, I returned to the infusion room with Mom and Robert and lots of other women (and only a few men again). I had a great chemo nurse this time – I wasn’t fond of the first one. Neither of them have been all that forthcoming, but at least this one was friendlier and she definitely knew how to get an IV going without hurting you. After the chemo treatment was complete, Mom, Robert and I went to eat at El Fenix and then Robert and I came on home. As with the first treatment, I felt fine the remainder of the day and was okay on the next day as well. Even on the third day I managed to vacuum all of the downstairs and do a little bit of dusting (not nearly enough). I didn’t deep clean by any stretch of the imagination, but the fact that I could clean at all was remarkable to me (especially when you consider how much I hate to clean house). But, the end arrived for feeling fine. The next couple of days were terrible. I was so nauseated. The nausea pills didn’t work at all so I quit taking them. I didn’t want to eat or drink. I could drink ginger ale but nothing else. And it wouldn’t necessarily stay down. 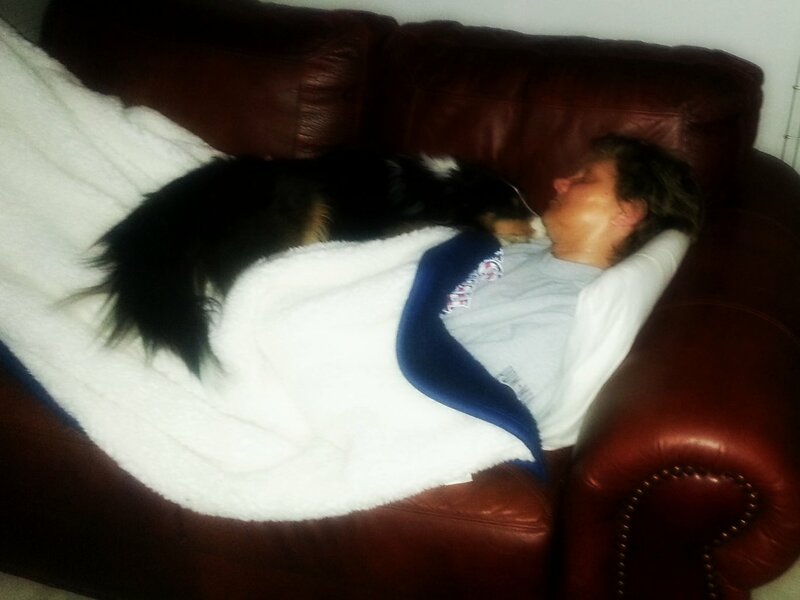 I stayed on the loveseat with my precious Barney right with me – usually on top of me. I felt dehydrated but the thought of drinking anything made me queasy. I could eat on occasion… One friend posted on Facebook how she was going to have tomato soup and grilled cheese – comfort food – that’s what I fixed for myself too. Doesn’t necessarily sound like food for a queasy stomach, but it tasted good! I kept a pot right beside me so that I didn’t have to try to make it to the bathroom or kitchen. I hate being sick. H-A-T-E it! I start wondering if this is really worth it. Being this sick is just no fun at all. And then one day, not so many days later, you wake up and you’re back among the living! It feels so good to feel good again!!! You’re so glad that you feel good again that your first inclination is to overdo it. Which sets you back ever so slightly. It has been great having chemo during Christmas vacation – I haven’t had to worry about calling in sick or anything. On the other hand, I hate that my entire Christmas vacation has been nearly “wasted” with trying to feel better. Sometimes, I guess you just can’t make me happy!!! 🙂 I know I am dreading the holidays drawing to an end. But that is not something new. Even when I wasn’t sick, I dreaded giving up my free time and returning to work. So, here it is, Thursday – one week since I had my last treatment. I feel pretty good, though I did take a long nap today and haven’t exerted myself much (at all). I was wishing we had agility class tonight but I don’t think we do. I sure do plan to be at class on Saturday. And, on Sunday, Cotton and Barney and I get to go to Terrell to play agility at the Run as One NADAC trial. I am so excited!! I signed up for 7 runs and I sincerely doubt that I’ll be up to that many runs. I imagine that I’ll be too slow to make time – NADAC times are very fast – but I bet I have a blast. It has been over a month since I have been to a trial. I hope I can do it! This catches us up. I’m going to try to keep this updated on a fairly regular basis. Even if no one reads it, it will be a great journal for me! I’ll try to make it more interesting with more pictures and stuff when I start updating it regularly.